A couple of nights ago while in Albuquerque, my friends and I sought out a restaurant I'd seen featured on The Food Network (okay, I'm a FN junkie). 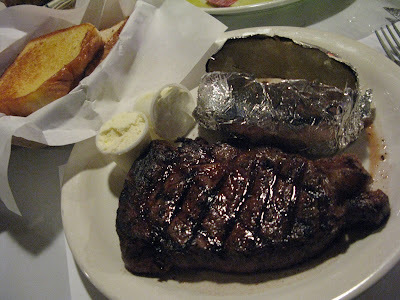 The Monte Carlo Steak House is on Central, a few blocks past Old Town and over the Rio Grande, tucked in behind a liquor store. Yes, literally. You have to walk through the liquor store to get to the restaurant behind it. Once there, you're saturated with local flavor and surprise, a wonderful local secret...a steak house known for their pork chops, and peppered with a Greek influence. Note the beautiful Greek salad my vegetarian friend devoured at this "house of flesh-eating sin." 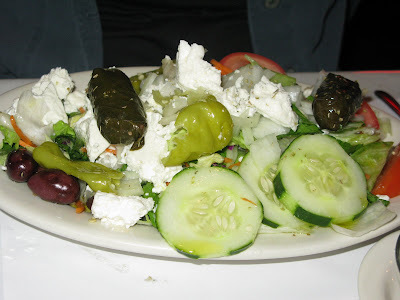 The dolmas were excellent and the feta sharp and fresh. (I had an appetizer of dolmas.) My vegetarian friend, who wailed prior to heading to the Monte Carlo, "But I'm a vegetarian! Why are you dragging me to a steak house?" Thanked us for taking her there while groaning in mid-bite. 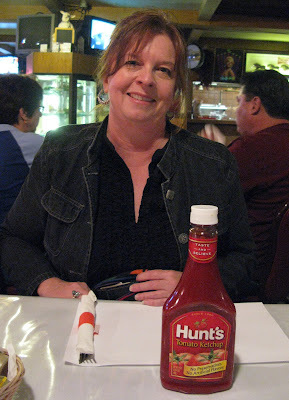 She especially favored the house salad dressing, which we dissected and think it was made with yogurt and dill and some mystery spice. Needless to say, she was sated after her salad and baked potato. Me? Um, I went for the steak. Ribeye, 10 oz, medium rare. Tender, flavorful and just enough marbling. I'm such a carnivore. More on the Monte Carlo Steak House to follow. Stay tuned.